“I’m fine, just cold,” the teen said as she exited the raft prior to being escorted into an ambulance parked a few feet from where water met the road. 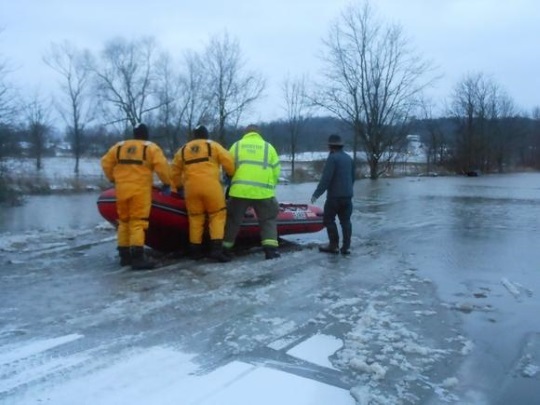 Rain and melting snow had caused the Sugar Creek to rise and flood neighboring areas. The water where the girl was found was close to five feet deep. Temperatures were cold – measured at 28 degrees at 5pm at the nearby Akron-Canton airport – which may not have been the exact temp at the time and place of the rescue, but it wasn’t a warm day. High winds were blowing at the time. Unfortunately, they horse died as a result. “With cold temperatures and water, the muscles (of the horse) seize up. And it’s hard to overcome,” said Lt. Carpenter. I’ve heard of rooftop flood rescues and rescues from cars, but this is the first time I’ve come across a buggy rescue. Good that this potential tragedy ended well, at least for the girl. I am sure you have been told at some point in your life to “Turn around, don’t drown”! You could have died and you did cost the horse his life for no good reason other than not using good common sense. Well, might have been a lack of common sense involved, but not a lot of details in the report I linked as to how it actually happened. Do you perhaps know something more about the incident? The local fire department apparently issued a warning “to motorists” about that road and several others, but not sure how that warning was dispersed and if it would have gotten out to the Amish. Generally I think people don’t realize the danger that high water can pose. Carpenter said the depth of water where the girl’s buggy got stuck was just shy of 5-feet. He was uncertain how she was drawn into the high water. Thank goodness she was rescued and is alive. So sorry about your horse. You are a very fortunate girl. Make sure that you thank God for His care and protection over you! It is of the Lord’s mercy that you are still alive! May you make sure that you are ready to meet your Maker, next time it might be different. No scolding from me. I wasn’t there and don’t know all the details. I am impressed she had the presence of mind to stay calm until help arrived. Life is precious at any age, but certainly so for one so young. I’d like to believe God has good plans in store for this young woman. Unless we were there none of us have any right to judge what this young lady had to face and what she had to do. I’ve seen video of just how fast flood waters rise and there’s nothing that will hold them back. Lets all just be thankful she is alright. I’m sure her family will miss the horse…but they can get another one. They can’t replace her. Some of these comments are SO RUDE,….Amen to not judging! Flood waters ARE unpredictable, the cost to replace those horses are sometimes megabucks $$$$, and the horse is like a part of a family. Tragedies happen, to most of us at one time or another, Amish and English alike. Glad she was rescued. Amish are people too, and not stupid, as some folks seem to think! I agree. What happened to this young lady was not because of stupidity, and truth be known, probably not even carelessness. An 18 year old young man in our community had a automobile accident 3 nights ago, around midnight on a school night. Driving at a high rate of speed and lost control, hit a power pole, and died. 4 months shy of his graduation from high school. Why out so late on a school night? Why would his parents to allow him to be out so late? THIS is stupid. Also a tragedy, but a stupid decision that could certainly have been prevented. There is no indication or information from the report as to the cause and reason why they were in the flooded area. Blaming the lady for the death of the horse is not even worth considering unless you first know the details. It could have been a flash flood for all you know. The woman could have been already along her route when the rain started down heavy and something happened where the horse was afraid to move and got stuck in the water. It could have been any number of reasons. Some people though just look to blame without being considerate of details. That is a general issue for a lot of controversies in this day and age. I live in the immediate area. These roads flood often because of the nearby dam and reservoir. This is not the first time a buggy has gone into flood waters around here where the horse has died and the occupants had to be rescued. It also happened on my own road a few years back; the couple went into the water and their excuse was “buggies can go where cars can’t”. They had to be rescued by a neighbor in a boat who heard them yelling. The horse was left there floating in the water until someone called the health department and the Amish were intructed to remove the horse immediately or be charged. Anyone who lives here knows that these waters get deep and should know not to go in. That being said, this girl was not charged because there was no “high water” sign up yet at the time. She had gone through earlier and it wasn’t as deep. She was younger and may not have been aware, and there are some newer families in the area who may be adjusting to the common flooding situation. She perhaps should have been instructed to not do this, considering the history of buggy vs issues here, but perhaps she was not. Hopefully others will take this as a reminder, but it seems to happen often still even so. Thank the good Lord that the girl is alright. We must understand there is alot going on in America and God sees the sins of our hearts. let us not judge one another in the flesh. Rather let us pray for one another. Thank God that girl was saved form the flood. Floods, Fires, earthquakes, and Tornadoes will increase in America this year. Yes Floods happen but know that nothing happens with out the Lord God knowing it. Jesus Christ knows all things. We all have doors open in our own lives, we need to go before the Lord and ask Him to forgive us and heal us. We are commanded to Love one another, forgive one another, and pray for one another.